The Prime Minister's victory speech in Marsa this morning started off on a sombre tone, as he spoke of the latest migrant tragedy in the Mediterranean. Dr Muscat said he was informed at 1am this morning that the AFM had been asked to assist in an Italian-led operation. A boat carrying 700 people was located outside Libyan territorial waters. A ship was sent to rescue them but as soon as they saw the vessel, the migrants panicked and the boat capsized. The AFM and Italian Navy are working at the site as we speak. Not more than 50 people have been saved. If confirmed this will be the biggest Mediterranean tragedy in the last few years. "Before celebrating we have to speak about humanity. Our soldiers are doing all they can, trying to save as many lives as possible. Malta and Italy are alone in this, everyone else shrugged off their responsibilities. Malta will not turn away from such tragedies, but if Europe continues to do so it will end up being judged in the hardest of ways." Dr Muscat promised that Malta would keep doing all it can, with its limited resources, to save every life that it can save. In 2012 the PL obtained a bigger majority but the circumstances were different. In that election it had obtained a higher percentage than the general election the following year. The most important thing is that the electorate has confirmed the same level of support to the Labour Party. The PL victory in Gozo did not come as a surprise, he said, because he knew that Gozitans had long ago realised that Labour was the better choice. The Opposition, he said, had tried hard to mobilise its traditional supporters. These factors made the labour victory more significant. Dr Muscat said the environment should also be brought to the forefront. Some of the biggest investments in the environment will be made in the south. The government will not forget anyone and will be listening to every last person, he said. “We will be giving our 200%." He thanked all candidates and appealed to them to put the communities they serve at the forefront. The government will keep announcing projects that will lead to the creation of new jobs. "The best things are yet to come," he promised. Justice Minister Owen Bonnici also addressed the event. In a jubilant speech he thanked those who had voted Labour, allowing the party to keep working to change the face of Malta. Dr Bonnici said this election will be remembered for many years to come because youths had become protagonists for the first time after the government changed the law to allow 16-year-olds to vote. Youths will now be at the centre of the work carried out by local councils. 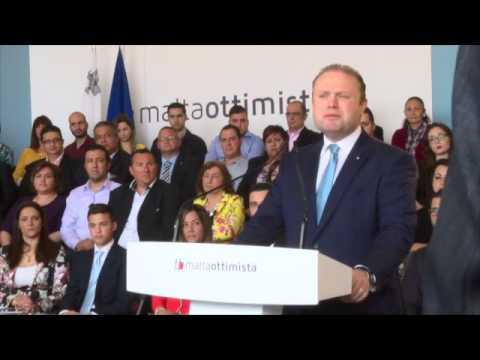 A sizeable crowd had gathered in Marsa by 10am to hear Prime Minister Joseph Muscat's victory speech after the PL won a 54% majority in the local council elections. 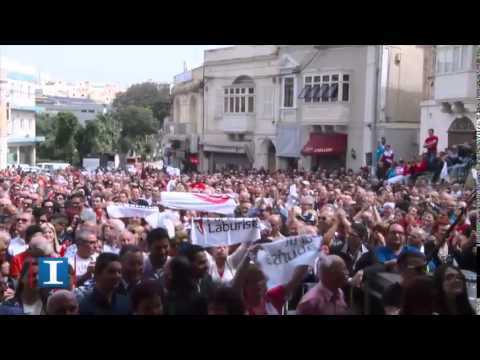 Loud music blared out from speakers as hundreds of PL supporters waited for Dr Muscat to arrive. Many supporters arrived on buses and could be seen waving their party flags from the windows. Labour's recently-anointed soldier of steel Manuel Mallia received a huge round of applause on his arrival.